Century City neighborhood sign for in City of Los Angeles. Photo by Los Angeles City Department of Transporation. See CITIES for origins of city names in Los Angeles County. Please note that the list below is not exhaustive, but offers only some Los Angeles County place names. ACTON - The name given to the local railroad station of the Southern Pacific in the mid 1870’s was taken from one the Actons in the east. ALTADENA - Literally means "Upper Dena," referring to its location relative to Pasadena. The name was applied in 1887. ALVARADO - Named after Juan B. Alvarado, governor of Mexican California 1836-1842. ANTELOPE VALLEY - Named for the graceful animal once found throughout California. ATWATER VILLAGE - Named for early resident Harriet Atwater Paramore. BALDWIN (PARK OR HILLS) - Named for E.J. "Lucky" Baldwin. BANDINI - Named for Juan Bandini, a powerful local ranch owner. BEL AIR - Named for developer Alfonso Bell. BENEDICT CANYON - Named for Edson Benedict who filed a claim for the land. BREA - Spanish for "asphaltum" or "tar." Name given to the local Spanish land grant. CAHUENGA - An Indian name, probably derived from the name of a local Indian village. CANOGO PARK - Believed to be named after Canoga, New York, which derived its name from the Native American village Ganogeh. CASTELLAMMARE - Italian place name, "Castle by the Sea." CENTINELA - Named for the Rancho de la Centinela, owned by Daniel Freeman. CENTURY CITY - Named for 20th Century Fox Motion Picture Company. CHARTER OAK - A local large oak tree was said to have reminded someone of the famous Charter Oak tree in Hartford, Connecticut. CHATSWORTH - Named for Chatsworth in Devonshire, England. CHEVIOT HILLS - Named by developers Forrester and Mc Connell who had Scottish backgrounds. CIENEGA - The present day name is actually a misspelling of the Spanish word "cienaga", meaning "marsh" or "swamp." The misspelling began with the name of the local ranch. DEL SUR - Spanish for "of the south." DOMINGUEZ - Named for Juan Jose Dominguez, one of the three former Spanish colonial soldiers who received local land grants from Spanish governor Pedro Fages in 1784. Dominguez presided over the vast Rancho San Pedro. EAGLE ROCK - Named for the prominent sandstone rock in the area that resembles an eagle in flight. EL SERENO - Spanish for "serene." ELYSIAN PARK - Once named Rock Quarry Hills because of the stone quarry in the area. In 1886, the City of Los Angeles dedicated Rock Quarry Hills as a public park and renamed it to its present name. ENCINO - The Portola expedition saw many live oaks in the area and named it "Santa Catalina de Bononia de los Encinos" in 1769. The area became the Encino land grant in 1840. EXPOSITION PARK - Originally known as Agricultural Park because it served as an agricultural and horticultural fairground during the latter part of the 19th century and early 20th century. The park was renamed in 1910 when it was planned to rededicate it as a State/County/City Park featuring a state Exposition Building, National Guard Armory, and county history and art museum. FIGUEROA - Named for Jose Figueroa, a governor of California under Mexico. GARFIELD - Named for the 20th president of the United States, James Garfield. GLASSELL - Named for Andrew Glassell, a prominent Los Angeles attorney and cofounder of the Los Angeles County Bar Association, who purchased the land from the old Rancho San Rafael tract. GORMAN - Named for a U.S. Army soldier from Fort Tejon who settled in the area after his discharge in 1864. GRANADA HILLS - Changed from Granada to Granada Hills in 1942. Named for the famous former Moorish city in Spain. GRIFFITH PARK - Named in 1896 by the City of Los Angeles for Griffith J. Griffith, donor of the land for the park. The observatory was also named in 1932 for Griffith who left funds for its construction. HACIENDA HEIGHTS - Hacienda is Spanish for "farm, estate." HANCOCK PARK - Once part of Rancho La Brea, the area was named for oilman Major G. Allan Hancock who, in 1916, donated the land to the county. HIGHLAND PARK - Originally named Garvanza, it became, in 1895, the first significant unincorporated area annexed by the City of Los Angeles. HOLLYWOOD - Many different stories abound here. A popular explanation is that it was the name given by the wife of founder Horace H. Wilcox who named it after the "Mass of the Holy Wood of the Cross" said by Father Junipero Serra near the site. It may have also been a name borrowed from one of the Hollywoods of the east. HONDO or RIO HONDO - The River San Gabriel changed its course in 1867, leaving the old channel to become known as the Rio Hondo after July 1888. HUGHES LAKE - Named for G.O. Hughes, an owner of land adjacent to the lake. HUNGRY VALLEY - Originally called "Honey Valley" by local beekeepers, the name was jokingly changed due to the area's high number of failed farming ventures. (Thanks to Bonnie Kane, Historian, Ridge Route Communities Museum & Historical Society). HYDE PARK - Named for the owner of a local lumberyard in 1887. LA BREA - Spanish for "the tar." Named for the tar or asphaltum beds. LA CRESCENTA-MONTROSE - Named by resident Dr. Benjamin Briggs who could see from his home three crescent-shaped formations. The name is not Spanish. LADERA HEIGHTS - Ladera is Spanish for "slope" or "hillside." LAX - The three-letter International Air Transportation Association airport code for Los Angeles International Airport. LEIMERT PARK - Named for developer and architect Walter Leimert. LENNOX - Named for Lennox, Massachusetts, former home of a settlement resident who met with a group to name the place. LINCOLN HEIGHTS - Originally named East Los Angeles, it was named for Lincoln High School built in 1914. LITTLEROCK - Named for the once prevalent rock and gravel pits in the area. 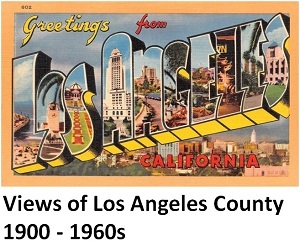 LOS ANGELES - see "Where Did the Name Los Angeles Come From?" LOS FELIZ - Named for the land grant owned by Jose Feliz. LOS NIETOS - Spanish for "the grandchildren." In this case, however, named for Manuel Perez Nieto, one of the three Spanish soldiers who had received local land grants from Spanish governor Pedro Fages in 1784. MAR VISTA - Formerly Ocean Park Heights, the name was adopted as a pseudo Spanish version of "View of the Sea." It was meant to distinguish the community from nearby Ocean Park. MARINA DEL REY - Marina is Spanish for "seacoast" or "shore." The name means "Seacoast of the King." Marina now is generally used to refer to small boat harbors. MOJAVE - Derived from the language of the populous and warlike Yuman tribe. MONTECITO - Name means "little woods." MONTROSE - The name, a popular one for U.S. towns, was chosen in a contest for the new development. MT. WATERMAN - Named for Robert Waterman, a U.S. Forest Service ranger from 1904 to 1908 in the old San Gabriel timberland reserve. MT. WILSON - Named for Benjamin D. "Don Benito" Wilson, who built a burro trail up the mountain in 1864. Wilson was also the first American mayor of Los Angeles under American rule and grandfather of General George S. Patton. NEWHALL - Name given to the local railroad station, named for Henry M. Newhall, owner of the land and a resident of San Francisco. NORTHRIDGE - Once known as Zelzah, the location was renamed "North Los Angeles" in 1933. In 1935, L.A. City Councilman Carl Dentzel proposed the name "Northridge" because the location lay along the northern ridge of the San Fernando Valley. OLVERA STREET - Named for Augustin Olvera, a Mexican resident and later first County Judge and first County Administrator under U.S. rule. PACIFIC PALISADES - Named by a Methodist church organization. Named for the seaside bluffs. PACOIMA - A Kizh (Gabrielino) word meaning "running water." PANORAMA CITY - Named for the former Panorama Dairy and Sheep Ranch that had once been at the location. PEARBLOSSOM - Named by Guy Chase for its once abundant pear orchards. The orchards died off in blight. PICO - Named for Pio Pico, last governor of Mexican California. PLAYA DEL REY - Formerly known as Port Ballona, it became an unsuccessful real estate venture in 1887. It was revived and renamed in 1902. POINT FERMIN - Named in 1793 by the explorer Vancouver for his friend Padre Fermin Francisco de Lasuen. PORTER RANCH - Once part of the George Keating Porter Ranch. QUARTZ HILL - Doubtless named for the quartz found in the area. RESEDA - Named for mignonette (a herb). ROWLAND HEIGHTS - Named for pioneer John Rowland who arrived in the area with the Rowland-Workman wagon train in 1841. SAN JOSE HILLS - Named for the San Jose Spanish land grant. SAN PEDRO - In October 1542, Spanish explorer Juan Cabrillo originally named the location "Bahia de los Fumos" (Bay of Smokes). It was later named after Saint Peter, patron saint of fishermen. SANDBERG - Named for Harold Sandberg in 1918, the area’s first postmaster and operator of an inn on Old Ridge Rock. Named for Harold Sandberg in 1918, the area’s first postmaster and operator of an inn on Old Ridge Rock. SANTA CATALINA - Named for St. Catherine by the explorer Vizcaino in 1602 on the occasion of the feast day of St. Catherine of Alexander. SAWTELLE - Named for local banker W.E. Sawtelle by streetcar operators Moses Sherman and H.P. Clark who planted a village there. SEPULVEDA - Named for Francisco Sepulveda, grantee in 1839 of the San Vicente Y Santa Monica ranch in the Verdugo Hills. SHERMAN OAKS - Named for developer Moses Sherman. SILVERLAKE - Named from Herman Silver, a member of the first Los Angeles Board of Water Commissioners. STONEMAN'S MOUNTAIN - Named in 1853 for Lt. George Stoneman, a member of the Pacific railroad survey. STUDIO CITY - Named for Mack Sennett’s Republic Studios opened in the community during the 1920s. SUN VALLEY - Once named "Roscoe," the name was changed to the present name in 1949 by a vote of local residents. SUNLAND - The name selected in 1887 for the local Post Office. SYLMAR - This location, once home of the largest olive groves in the world, received the creative name meant to mean "Sea of Trees," combining the Latin silva (for "forest") and the Spanish mar (for "sea"). TARZANA - Named after famous fictional character "Tarzan" after Edgar Rice Burroughs purchased the local Otis Estate in 1917. The local post office was given the name in 1931. TERMINAL ISLAND - Originally named "Isla Raza de Buena Gente" (Island of the Race of Good People). Early in the American era, the island became known as Rattlesnake Island. In 1911, after the Los Angeles Terminal Railway had built a line from the city to the island, it assumed its present name. THROOP PEAK - Named for Amos G. Throop, founder of Throop University, now known as Cal Tech. The U.S. Forest Service also refers to the peak as North Baldy Peak. TOLUCA LAKE - Name derived from an old Aztec name. TOPANGA - Indian name referring to "above place" or even sky or heaven. May refer to Indian village site located above Topanga Creek. TUJUNGA - Derived from the Indian place name Tuyunga meaning "mountain range." UNIVERSAL CITY - A local post office was opened on the site in 1915 and named after the Universal Pictures Company that had been organized that same year. VAL VERDE - Name combining the Spanish valle (valley) and verde (green). VALENCIA - Named by the developer Newhall Land & Farming Co. for the type of oranges that grew there. VALINDA - Believed to be a combination of the Spanish words valle (valley) and linda (pretty). VALLEY VILLAGE - Once part of North Hollywood, the community disassociated in 1991 and reclaimed its original name. VALYERMO - Spanish for "desert valley." Named for a nearby rancho. VAN NUYS - The local post office was named for Isaac N. Van Nuys, son-in-law of Isaac Lankershim. They were the first to successfully cultivate wheat on a large scale in Southern California. VANOWEN - Named by Harrison Gray Otis, publisher of the LA Times, because the street served as a connector between Van Nuys and Owensmouth (now called Canoga Park). VASQUEZ CANYON; VASQUEZ ROCKS - These exotic rocks were named for the notorious bandit Tiburcio Vasquez who hid among the rocks. VENICE - Abbot Kinney in 1904 built this community as part of his Ocean Park tract, envisioning it as an imitation of Venice, Italy. VERDUGO CANYON - Named for Jose Maria Verdugo, one of the three former Spanish colonial soldiers who received local land grants from Spanish governor Pedro Fages in 1784. VICENTE POINT - Named by English explorer George Vancouver in 1793 for his friend Padre Vicente Santa Maria of the Mission San Buenaventura. VINCENT GULCH - Named by the U.S. Forest Service for pioneer miner Charles Vincent. WARNER CENTER - Once the site of the ranch of studio mogul Jack Warner. WATTS - Named for C.H. Watts, a Pasadena realtor and local landowner, circa 1900. WESTLAKE - Named for its geographic location relative to MacArthur Park. WESTWOOD - Once known as Sunset City, a failed development, it received its current name in 1929. WILLOWBROOK - Said to have been named for the once prevalent willows and springs in the area. WILMINGTON - Named for Wilmington, Delaware, birthplace of Phineas Banning, local transportation pioneer and land owner. WILSHIRE - Named for entrepreneur, socialist, and developer H. Gaylord Wilshire. WINNETKA - Named by Charles Weeks for his local poultry business that was named after another that he owned in Winnetka, Illinois. XIMENO - A Spanish name (also Jimeno). It is the only California community name that starts with "X." The name is possibly from Manuel Jimeno Caserin.